I think I have mentioned before how I am not a huge breakfast fan. I remember one time my sister and I mentioned to our mom how we liked ego waffles and next thing we knew, our whole freezer was stuffed with ego boxes. Of course after eating egos for two weeks each morning, we got tired of them! And there were still about 6 boxes we had to go through. Everyone goes through phases of liking and not liking foods but this picture is of my most recent breakfast phases: a simple egg over easy on toast topped with shredded manchango cheese. It literally takes about 4 minutes to prepare, less time to eat and that means I have more time to sleep in! Mmmm, simple eggs! 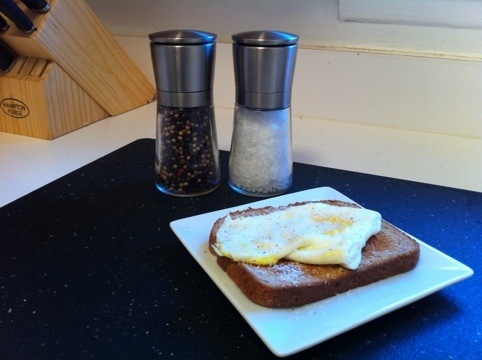 I like to add a little Chili Powder to my eggs, gives them the smokey flavor similar to bacon. Thanks for the reminder – sometimes the simple things are the best.